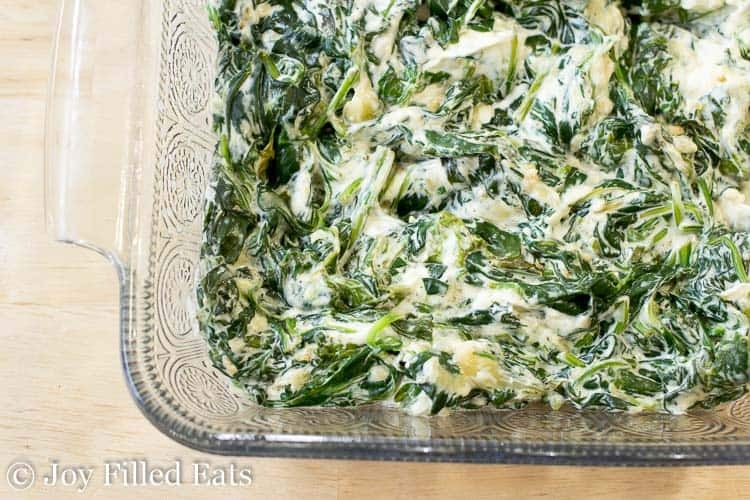 This is the best healthy creamed spinach recipe ever. 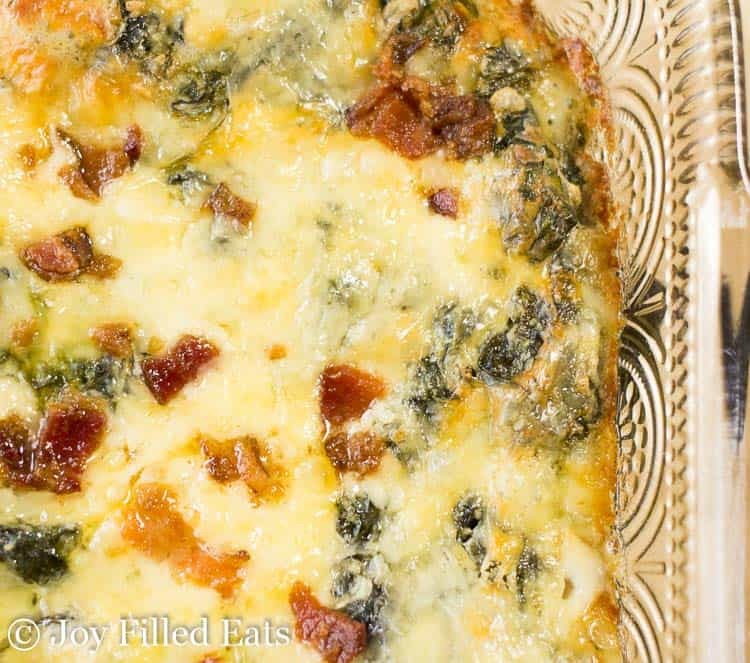 With just 6 ingredients and 5 minutes of prep, you can have cheesy, bacony creamed spinach at the dinner table in no time. Anything with bacon and cheese falls into the comfort food category in my family. I take those two rich and indulgent foods and add them to casseroles, salads, side dishes, and more. If it has cheese and it has bacon my kids will eat it. 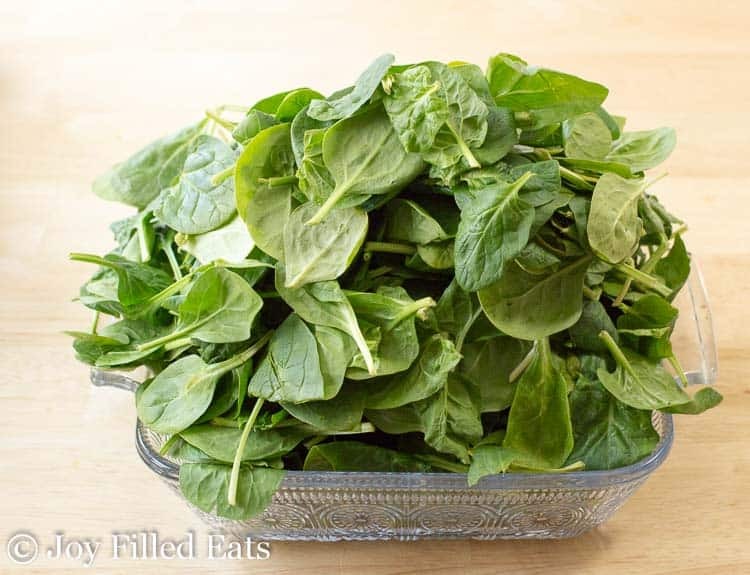 I can imagine the reactions if I just bought the casserole dish full of raw spinach (pictured below) to the dinner table. But, mix in some bacon and cheese and it’s a hit. I never cease to be amazed how much spinach cooks down. From the photo above to the one below you can see how much my keto creamed spinach shrunk. Even adding some other ingredients didn’t bulk up the bottom. When I was cooking this creamed spinach with cheese for a birthday dinner I kept looking at my overflowing saucepan of fresh spinach and wondering if I needed to add more. I really could have. 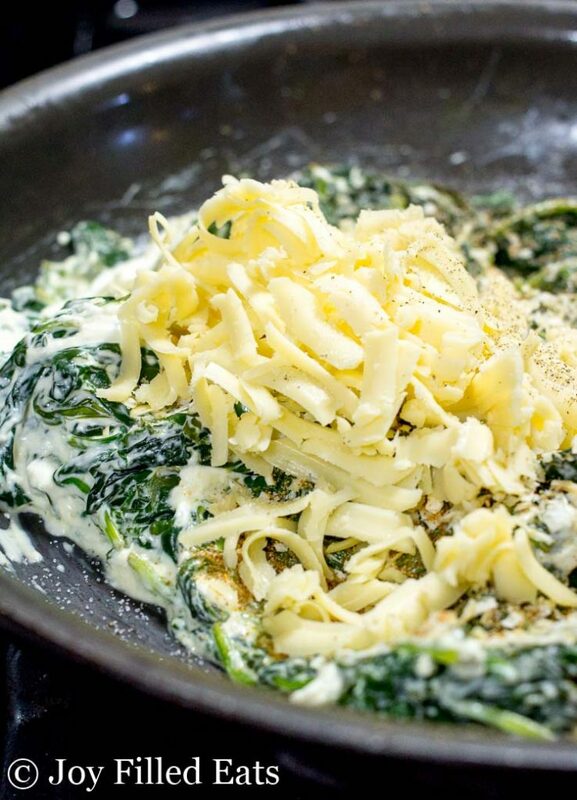 If you’d like to lighten up this dish you can either cut the amount of cream cheese and shredded cheese in half or just double the amount of spinach. Saute the spinach with some seasonings. Add cream cheese and let it melt into the spinach. Add shredded cheese and bacon. 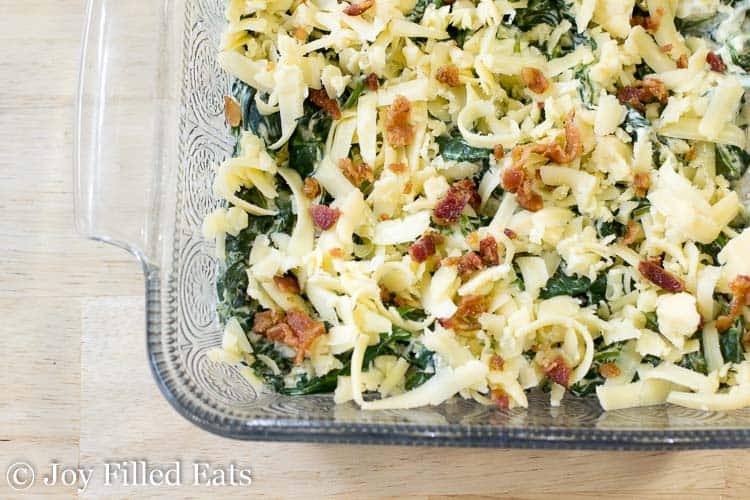 You can serve it immediately right from the skillet or transfer the healthy creamed spinach to a casserole dish and bake it to brown the cheese topping. 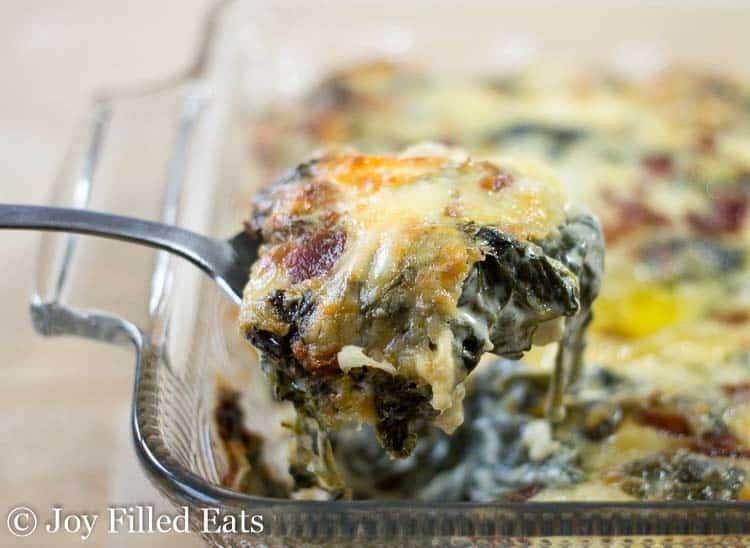 I hope you enjoy this keto creamed spinach recipe! 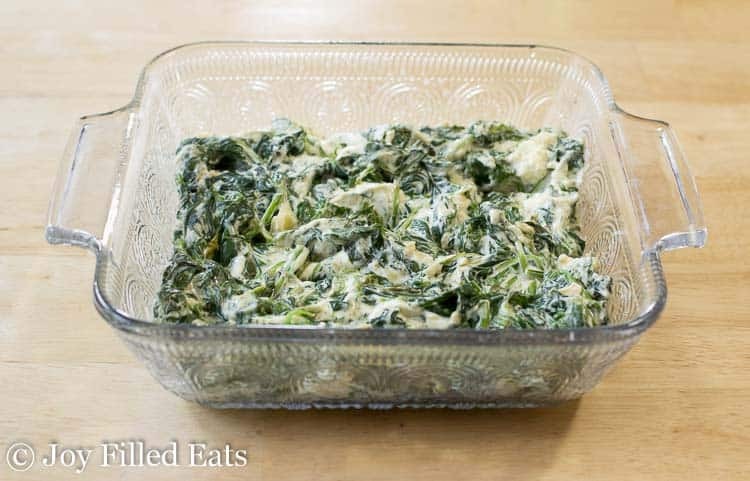 This is the best creamed spinach recipe ever. With just 6 ingredients and 5 minutes of prep, you can have cheesy, bacony goodness at the dinner table. Preheat oven to 400. Spray an 8 x 8 baking dish with cooking spray. Spray a large skillet with cooking spray. Add the spinach, cover, and cook over medium until the spinach has wilted. Add the cream cheese, onion, and garlic, and stir until the cream cheese has melted. Remove from the heat. Add half the gouda cheese and season with salt and pepper to taste. Transfer to the prepared baking dish. Top with the remaining cheese and crumbled bacon. You can sub 10 oz of frozen spinach for the fresh spinach if you prefer. 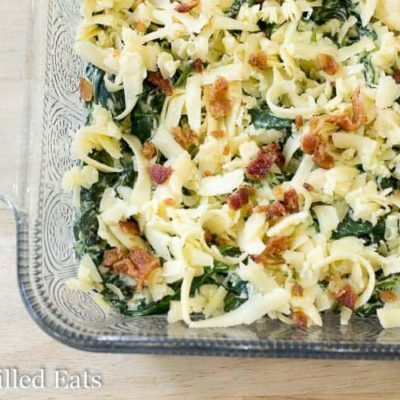 If you'd like to lighten up this dish you can either cut the amount of cream cheese and shredded cheese in half or just double the amount of spinach. Had this on my list to make for so very long! Finally remembered all the ingredients at the store yesterday and just made it. YUM! I could eat this every single day! Hi, just made this but trying to enter the nutritional info in my Carb Manager app. I know you said it's 6 servings so would it be 1 serving for 1 person? Thanks! But what's considered a serving? An ounce, a cup? Thanks! By the way, this dish was DELICIOUS! Can this be made ahead and baked in oven the next day? Would you just prepare up to the point prior to adding the remaining cheese and baking? Yes, that's exactly what I would do. Enjoy! This sounds delicious. 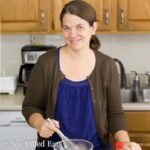 I've been reading through ALL your recipes as soon as I discovered your blog! Do you think this would be freezer friendly? I think so but I haven't tried yet. What would be a good substitute for the Gouda? Any other cheese you enjoy!